These official size 3x4Ft U.S. Army Signal Brigade flags are made to Army regulations (AR-840) and meet US heraldry specifications. They feature a fully embroidered design sewn onto luxurious rayon fabric and are finished with a pole hem and fringe. These flags offer the fullest visual effect for display and are made for indoor display. Description- The flag has two vertical stripes of equal width. 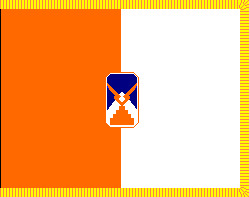 The first stripe is the primary branch color and the second stripe is the secondary branch color. The shoulder sleeve insignia is centered in proper colors, l5 inches high. The fringe is yellow.